October 16, 1917 The Grinnell W.C.T.U. met in the Cong. Church held a prayr meeting for the success of the Amendment before the regular meeting. Mrs Brown of Kansas a former President of this Union led the Devotional meeting she read a number of helpful verses of scripture and ask for prayrs for the success of the Amendment. on the 14 Mrs Lincoln and Mrs Stocks spoke in the Cong. Church in Chester.. Mrs Stocks reported cost of material for float in the Temperence Parade 50 cents Voted to have Mrs Stocks send for Literature. Voted to give $5.00 to the Temperance Alliance. Voted to send $5.00 to State Union as a thank Offering. Miss Bailey told us she was pleased to be made a life member of the Union. Mrs Comly attended to packing a barrel of fruit and clothing for Benedict Home. Miss Buck gave an excellent Programe on the Problems of Finance. Meeting closed with the Mizpah. Mrs Chas. W Nov 19, 1917 The W.C.T.U. Meeting opened by Singing. The Devotional meeting was led by Mrs John Lincoln she tool the letters W.C.T.U. and chose verses of scripture beginning with these letters to bring helpful thots to us followed by short prayrs. The Union contributed ten dollars for the pictures for the Soldiers at Camp Dodge. Miss Dawkins kindly sang a solo for us. Mrs Stocks our delegate to the Convention at Waterloo gave us a very good report of the Con. The Con. was held in Grace M.E. Church with 67 County Presidents in attendance. 50 New Unions have been organized. 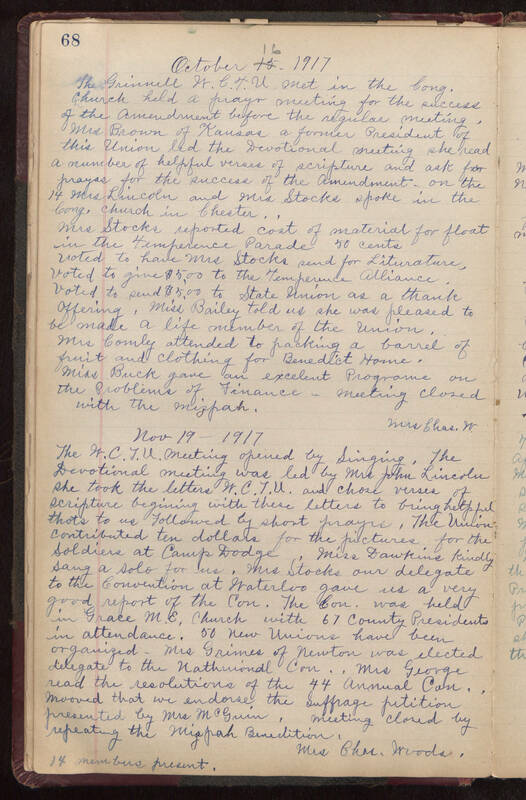 Mrs Grimes of Newton was elected delegate to the [Nathnional?] Con.. Mrs George read the resolutions of the 44 Annual Con.. Mooved that we endorse the Suffrage petition presented by Mrs McGuin. Meeting closed by repeating the Mizpah Benedition. Mrs. Char. Woods. 14 members present.